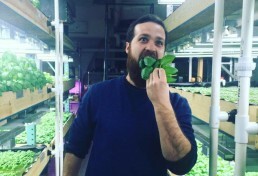 Verticulture is a vertical farm based in Brooklyn, New York City. They are made up of agriculture professionals with expertise in ecological design, fish and plant biology, economics and business. Miles Cretien and his parters built an aquaponic research and development farm on the roof of the old Pfizer building in Bedstuy, Brooklyn. There they are testing their growing technology and its commercial viability for the New York City market. As fish eat and grow, they produce nutrients like nitrogen that are used by plants to form proteins for cell growth. Thus plants are used to remove the excess nutrients from the system and provide clean, ammonia and nitrate free water for the fish. Also check out the crowdfunding-video Verticulture made to finance their farm. with less than $10.000 they started up their 10,000 square foot aquaponic farm which produces nearly 60,000 pounds of fresh herbs and greens and raises over 14,000 pounds of fresh fish annually. VertiCulture is creating aquaponic production facilities around the NYC area that provide fresh and highly nutritious food to economically and culturally diverse populations.